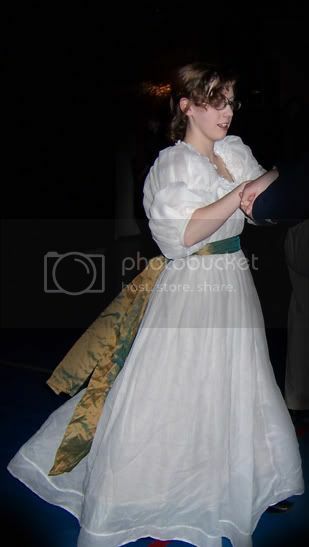 This dress, circa 1784 or so, was completed in January 2008 for my friend Gwendolyn to wear to a Regency ball in Ann Arbor, Michigan. Yes, we both realize that 1784 is a good twenty years before the actual Regency period. However, the options were as follows: Gwendolyn die a horrible death trying to finish an extremely complicated 1820s gown in two weeks, Gwendolyn not go to the Ball for lack of something to wear, OR--I could make a slightly out-of-period but simple-to-make style of dress at the last minute and gift it to her so she'd just go to the dang ball already. Obviously, we chose C--make the dress and deal with the periodicity of it later. I already owned all the materials except for the fabric for the sash; Gwendolyn supplied that herself. The dress itself is constructed of cotton organdy. It was originally tie-dyed blue, but RIT color remover worked its magic and I had several yards of white organdy lying around. The shoulder straps are lined with fine lightweight linen/cotton blend fabric, the same as I used for my 18th century caps. The idea was to use exclusively fabric that I already owned, since I had roughly two weeks to complete the dress and no money to spend on it. It's fitted with two cotton-cord drawstrings, one around the waist and one across the front of the neckline. The back neckline is gathered permanently to size. An embroidered lace flounce around the neck finishes the fluffiness off nicely. Full-length shot, complete with laughter. Or maybe it's confusion, since this was the first time any of us had tried actual English Country Dancing. The dress in action at the Ann Arbor ball on February 1, 2008. I'm pretty sure that sash is longer than I am tall. Also, the "tuck" around the hem is actually structural--I had to piece it for length because I had an extremely limited amount of fabric with which to work.